Black and white customized Family Kitchen Rules Canvas Print is perfect for adding a little playful charm to your kitchen. 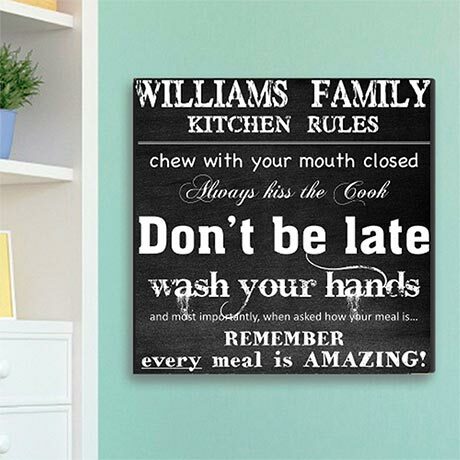 A bold black background, distressed white text, and charming chalkboard texture effects, humorously displays your family's kitchen rules and can be personalized to feature your family name or surname (up to 20 characters). 24" x 24". Allow 2-3 weeks for delivery. No rush or gift box. Item can only be shipped within the Continental US.